Located in Cheshire, Little Bumpkins design and create beautiful quality bedroom door signs and gifts for children. Little Bumpkins was set up in 2010 by husband and wife team, Linden and Heidi Huckle. 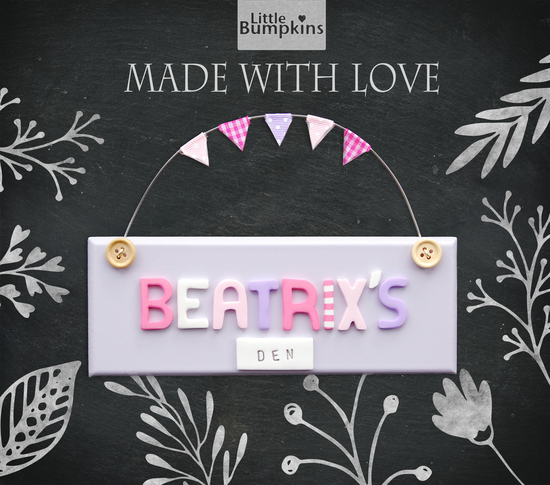 All Little Bumpkins signs are completely hand made in our little studio in the beautiful Cheshire countryside. A totally unique gift, ideal for a new baby or Christening present. If you would like any information about our business or products, please do not hesitate to contact us, we are always happy to help.